Project365 :: Introductions :: Who are you? 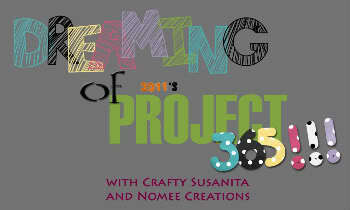 My name is Nohemi of Nomee Creations. I'm a mother to 3 young kiddos and a full time worker at a 3rd party logistics company. I started with photography in January of 2004, 4 years later I found digital scrapbooking. A year after that I started www.nomeecreations.com. Its been an awesome time so far. I decided to start a forum for Project 365 when I realized this wouldn't be as easy to complete without some help. I hope that with this forum we can all be of support to eachother in learning new techniques and giving. feedback. Hi from downunder . . .
so glad you decided to join our little clan I look forward to viewing your photos this year! Hi everyone my name is Adrian a.k.a Drizz. I found this project by way of craftysusanita on Facebook and thought it would be good practice and a fun project to be a part of. I love photographing everything from glamour to landscapes and always enjoy sharing my pictures and giving and receiving constructive criticism, so let me have it. It's the only way to get better. I’m Suzy a 26 yr old mommy of twin boys. I love everything that has to do with art. I like to cook, craft and digital scrapbook. I love creating and capturing beautiful things. I decided to get into photography through my kids. I am by no means a professional photographer but sometimes when I capture the right moment in the right angle I can be. I’m a natural light photographer, which means I use only available light for my photos. This gives the photos a better feel and a more natural sense of depth and color. I don’t have fancy lights or studio umbrellas; it’s just me, my camera, and my talents! My style is much more natural and relaxed, capturing those rare in-between magical moments. I don’t like staged photography. I like to capture real emotion and happiness, not forced smiles. Those are the priceless moments. The one’s where you can capture a genuine smile. I hope this project helps me grow as a photographer. I enjoy the challenges and look forward to viewing everyone’s pictures. Hello everyone. My name is Omar I came across project 365 via Nohemi's Facebook page. I was just blown away by her pictures it made me remember how much I like taking pictures and thought I should get back to it. This project is actually more challenging than I thought it was going to be, but I'm up for the challenge. I can't wait to see what everyone else will comes up with. See you all on the forum. Thanks for joining Im glad my photos motivated you!!! yay!! !